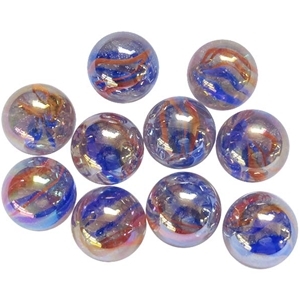 These "Funfair" marbles have a clear base containing a vein of opaque glass made up of three colors; red, white and bllue. The marbles are iridized giving them an extra shiny reflective surface. They measure approximately 1 3/8 or 35mm and are sold in packs of 10 or 50 marbles. Sizes may vary slightly.